The disease is caused by the West Nile virus, a positive-strand RNA flavivirus. 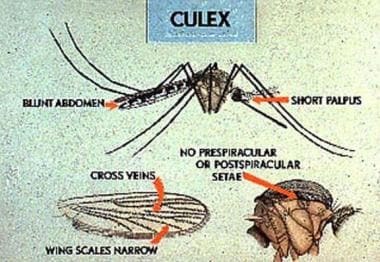 It is transmitted via the bite from the Culex mosquito and is known to infect humans, birds, horses, and other mammals. Birds act as a primary reservoir and means of viral replication, with high levels of viremia observed in infected crows, sparrows, blue jays, and other passerine birds. WNV infection manifests as two clinical syndromes: West Nile fever (WN fever) and West Nile encephalitis (WNE). WNE can be defined as disease that causes encephalitis, meningitis, or acute flaccid paralysis. When the virus infects these structures of the central nervous system, it may be described as neuroinvasive disease. See 7 Bug Bites You Need to Know This Summer, a Critical Images slideshow, for helpful images and information on various bug bites. For more information, see the Centers for Disease Control and Prevention (CDC) fact sheet on West Nile virus, links to state and local government web sites on West Nile virus, and the Environmental Protection Agency (EPA) article on mosquito control. Avoidance of mosquito exposure, particularly around dawn and dusk, may help mitigate the risk of exposure to WNV. Mosquito repellents, such as DEET, as well as barrier netting, are helpful. More than 150 bird species have been reported as WNV-positive in CDC surveillance programs. However, passerine birds (eg, species of jay, sparrow, crow, songbirds) have been shown the most competent in acting as disease reservoirs, demonstrating high levels of viremia for up to 1 week. Bird-to-bird oral transmission has been demonstrated among birds kept in close contact, but bird-to-human transmission has not been reported. However, standard precautions are still recommended when handling dead birds.